The Turkish State has finally recognized the Jewish community in Izmir, the country's third largest city, as a legal entity. The Directorate General for Foundations (VGM) granted the community foundation status and thus the right to register the community's immovable properties. Following VGM's decision, the Izmir Jewish community will be legally considered a foundation with full control over its assets and 22 immovable properties, including 18 synagogues and four stores in the city. In 1935, Turkey adopted its current Law on Foundations and in 1936 asked non-Muslim communities to declare their sources of income and budget. Most of the minority foundations made these declarations in 1936, called the “1936 Declarations.” Those who submitted their declarations are considered non-Muslim communities, and their organizations were given foundation status, allowing them to have the privilege of registering all facilities listed in their declarations in 1936 as their own property, regardless of the name of the person on the original deed, thus giving them the opportunity to enter their property into the national deed registry. The head of the Izmir Jewish Community, Jak Kaya, pointed out that the community could not become a foundation in 1936 as it could not give a declaration. 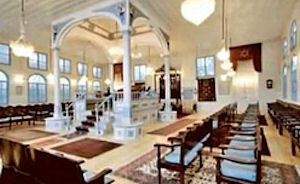 Izmir is home to an ancient Jewish community of around 1,700 members. It dates back to the second and third centuries CE, when the Greeks called the town Smyrna. Located in western Anatolia at the edge of the Aegean Sea, Izmir is today Turkey's third-largest city and has 3.4 million inhabitants. Of the once 34 synagogues 13 remain, though half of them lie in ruin. Several Jewish sites of Izmir have been declared an international site of cultural and archeological significance by UNESCO.